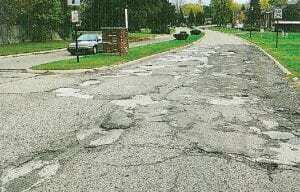 Jim Rouse, a River Forest resident, showed the township board many photos like this one of badly deteriorated streets in his neighborhood. FLINT TWP. 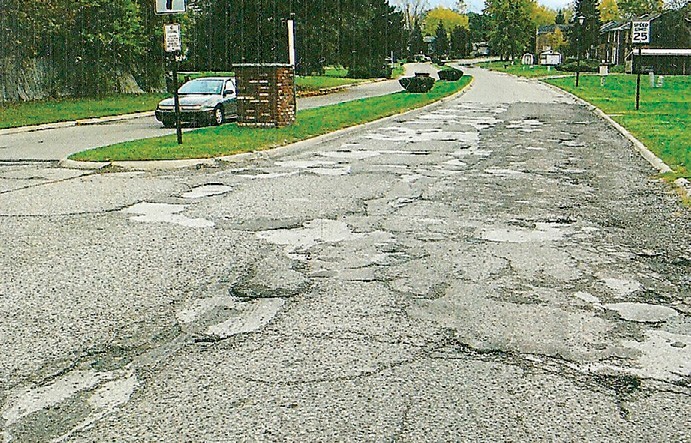 — ”The worst road in Genesee County’’ brought a room full of fed-up residents to a township board public needs hearing Monday night to make a pitch for using Community Development Block Grant funds to repave it. Jim Rouse, a member of the township’s Road Advisory Committee, was one of many residents of the River Forest subdivision off Beecher Road who spoke about deplorable road conditions left unresolved for decades. “I always say a picture shows better than words,’’ said Rouse, as he passed around photos of badly deteriorated streets in the area. The pitted streets also pose a hazard to pedestrians accessing trails behind the subdivision and has been the cause of accidents as motorists swerve to avoid badly pitted areas. “I urge you to spend the Community Development Block Grant funds on that,” Rouse said. He was followed by numerous speakers who also cited damaged vehicle repair costs, embarrassment when people visit and accidents. One woman said the streets have only been patched but never replaced in the 32 years she has lived there. “They put up a sign that says rough road, 15 mph,’’ she said to knowing laughter from her neighbors. “The emergency vehicles cannot move with deliberate speed because the roads are so bad. Also I know people who have moved because of the streets and people who won’t move in because of the streets,’’ she said, adding that large trucks also come down the roads because there is no maximum weight posted. Supervisor Karyn Miller acknowledged that the township board has long been aware of the road conditions but faced with the problem of how to fund a costly repaving project. Many of the streets are concrete which costs more than asphalt to replace. Miller said she has received estimates ranging from $125,000 up to a half a million dollars for the project. Besides a special assessment that would be charged to residents, using CDBG money is one of few alternative funding options and even that might not be enough, she said. Clerk Kim Courts explained that CDBG money designated for low- to moderate income projects can be used for road repairs. The problem is uncertainty about whether the River Forest area is eligible. Courts said that the township has yet to receive updated 2010 census information indicating low-to-moderate income zones and therefore has to rely on 2000 census data. Courts said she believes the area does now meet income qualifications but she needs the census data to confirm it. Another way to document the income status would be by having area residents fill out a survey, she said, which can be tedious process because many people do not want to divulge that information. Trustee Belenda Parker suggested moving forward with submitting River Forest road repairs as a proposed CDBG project and leave it up the county to determine whether the area qualifies. Board members generally seemed sympathetic and receptive to using CDBG money to fix River Forest roads. In related action, after closing the public hearing, the board unanimously approved a 2014 CDBG spending proposal. Street improvements accounted for nearly half of an estimated $254,727 allocation expected from the Genesee County Metropolitan Planning Commission under an annual entitlement grant from the U.S. Department of Housing and Urban Development. Courts noted that about $40,491 is earmarked for a public service project supporting the food pantry at the senior citizen center but none of the other recommended CDBG allocations are etched in stone.